Been diving in Bunaken? Please Vote! If you want to feel the rhythm of the underwater life in the heart of Coral Triangle, then your next diving destination might be Bunaken National Marine Park. This is a great example of one of the best preserved Marine National Parks of the World. Such caring attitude results in a bewildering number of underwater species among which you might also be delighted to find Dugong, Sharks, Whales, Turtles, and Sea Snakes. It is a heaven for macro diving and observation of different Nudibranchs, Starfish, Crustaceans, and amazing Mandarinfish. Five Islands of Bunaken, Montehage, Manado Tua, Nain, and Siladen form a unique Bunaken National Marine Park in the northern part of Sulawesi in Indonesia. Bunaken is the largest Island which covers 8 km² (3ml²). In order to arrive at Bunaken, you will need to take a flight to Manado via Jakarta or directly from other destinations. Then you will need to take either a public boat or a private boat to the Island. Private boats and charters are usually organized by the resorts, so you can check it when making a booking. A trip on the boat takes between 30-60 minutes depending on the vessel. The Island is rather small; you will not find any cars there. So you can choose to walk, to hire a boat or a scooter to get around. All adults need to pay an entry fee to Bunaken National Marine Park. You can choose between a daily fee of 50.000 Indonesian Rupiah (~3,8 USD) or a yearly fee of 150.000 Indonesian Rupiah (~11,4 USD) if you plan several trips. In return, you will get a waterproof plastic tag which needs to be carried with you in the case of a patrol boat check. Bunaken National Marine Park impresses with the clarity of the water and great visibility, a variety of fish and corals, reptiles and marine mammals. The main reasons for such underwater biodiversity are the Indonesian Throughflow and large depths between the islands of the Archipelago going down to 1500m (4921ft.). The difference between the levels of the Pacific Ocean and the Indian Ocean results in the biggest water movements on the Planet. That is why Bunaken National Marine Park is influenced by the north-east current bringing nutritious waters to feed fish, larger pelagic, and mammals. The strongest currents are felt on the western and eastern sides of the Islands, where such dive sites as Timur 1 and 2 are located. Five Islands offer more than 50 dive sites. 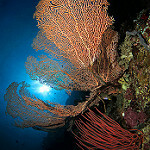 Advanced divers can practice wall, deep and drift dives at Bunaken National Marine Park. Walls can go really deep in some of the places, so it might be a good idea to check you depth regularly. However, sites for beginners can also be found in the Park. Please note that a permit is needed in order to dive at Bunaken National Marine Park. Local dive clubs usually take care of this permit. Another option is to buy the permit in a ticket office either on Bunaken Island or Siladen Island. Depan Kampung can be found in the southern part of the Islands. Due to strong currents, this dive site is recommended for drift diving along the wall with canyons and crevices. The average visibility here is 25m (82ft.). Fish is represented by Butterflyfish, Triggerfish, Angelfish, Fusiliers, Moorish Idols, and Damselfish. Larger inhabitants of this site are Napoleon Wrasse, Whitetip and Blacktip Reef Shark, Turtles, and Banded Sea Snake. In the southern part of Bunaken Island, there are 3 dive sites being rated among the best in the underwater world. Usually, the walls are protected from currents. Divers of all levels can find a dive spot which suits them best. The average visibility is about 30m (98ft.). Starting from the Giant Sponge, Sea Fan, and Black Coral you can move over to study Basket Star, Cleaner Shrimp, Nudibranch, Spanish Dancer, and Sponge Crab. The most common species of fish are Bannerfish, Butterflyfish, Parrotfish, Surgeonfish, and Unicornfish. The larger residents are Turtles, Napoleons, Barracudas, Whitetip and Blacktip Reef Sharks, and Bamboo Sharks. You might be lucky to spot an amazing Mandarinfish as well. Lekuan III offers one of the most amazing night dives. Mandolin Point is located in the south-western part of Bunaken Island. This is the site to try deep diving for the advanced divers. Current can be medium and strong here. You can meet a wide range of reef and pelagic fish here as well as hard and soft corals. Whitetip and Blacktip Reef Sharks are frequently seen at this site. You can try to spot different types of crustaceans like Commensal Shrimps, Porcelain Crabs, and Candy Crabs. Molas Wreck is one of few wreck dive sites at the Islands. She used to be a 60m (196ft.) long Dutch cargo vessel which sunk in 1942. The bottom lies at 37m (121ft.) and the top is located at 24-26m (78-85ft.). Because of the average depth of 28m (91ft. ), this dive site should be accessed only by advanced divers. The wreck is covered with sponges, hard and soft corals. Here you can find Batfish, Barracuda, Napoleon, Reef Shark, Banded Sea Snake, Ribbon Eel, Snapper, Trevally, Grouper, Boxfish, Triggerfish, Surgeonfish, and Parrotfish. This dive site is situated next to volcanic Island of Manado Tua. You can find both a plateau from 5 to 30m (16-98ft.) and a wall dive here. If the current is not strong, this site is great for underwater photography. Besides you can spot Barracuda, huge schools of pelagic fish and even Hammerhead Shark. 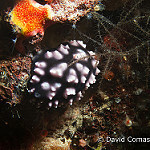 Timur dive site consists of a wall with crevices full of hard and soft corals. Here you can expect to see Green Turtles, Sharks, Eagle Rays, Surgeonfish, Parrotfish, Wrasse, Butterflyfish and many others. Among the smaller ones, you can try to spot Ghost Pipefish, Seahorse, and Leaf Fish. There were few cases when divers came across Whales at this dive site. Bunaken National Marine Park is a year-round destination. July and August are the top months. 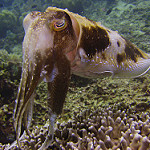 Diving is the best during the dry season between May and October when visibility is the best. The water temperature is usually 27-30ºC (80-86ºF) all the year round. Thus, a 3mm wetsuit might be the best choice to protect you from the coral cuts. 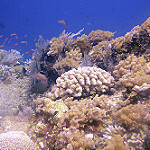 Bunaken National Marine Park is famous for its visibility which can reach up to 50m (164ft.). During November and April, the wet season brings rains and storms which decrease the visibility. However, the visibility still tends to be around 15-30m (49-98ft.) which is excellent compared to many other dive destinations. If there is medium or strong current divers usually make a drift dive in order not to fight with the current. In this case, a boat follows the divers and picks them up at the end of the dive. It might be a good idea to take a buoy with you for such dives. Bunaken National Marine Park thrives with marine life. There are 7 of 8 types of world’s Giant Claims; about 390 types of corals; 90 species of fish; 5 types of Sea Turtles. Even such species as Nautilus, Dugong, Saltwater Crocodile, and some species of Whales have been spotted at the Islands. Dolphins and Banded Sea Snakes were often noticed around. Fish include Surgeonfish, Butterflyfish, Bannerfish, Parrotfish, Trevally, Lionfish, Stonefish, Wrasse, Snapper, Grouper, Boxfish, Triggerfish, Surgeonfish, and Unicornfish. 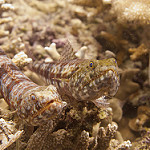 Among smaller fish you can enjoy Mandarinfish, Leaf Fish, Ghost Pipefish, and Seahorse. The brightest representatives of the larger pelagic are Tuna, Barracuda, and Napoleon. Those who prefer macro photography might be happy to take pictures of Porcelain Crabs, Sponge Crab, Candy Crabs, Commensal Shrimps, Cleaner Shrimp, Basket Star, Nudibranch, and Spanish Dancer. Amateurs of sharks can enjoy Bamboo Shark, Whitetip and Blacktip Reef Sharks, and occasional Hammerhead Shark. Most of the fish are residents of the area, so they can be seen all the year round. Sharks are more often spotted in June. Whales usually migrate through the area in March and in July-August. Many times mating of Mandarinfish was spotted between August and October during the sunset and night dives. This is an amazing underwater spectacle which you might remember forever. Almost all hotels and resorts of the Islands provide diving and snorkeling services along with accommodation. Most of the resorts can serve only a limited number of guests. This is a PADI Dive Resort providing accommodation in 17 Superior, 9 Standard, and 2 Budget Rooms. Bastianos is located on the western side of Bunaken Island where you can snorkel along the coral reef. The facilities include a restaurant, Spa, pool, and a marine life library. The Resort is located in the eastern part of Bunaken Island. It can accommodate up to 20 guests in Villas and Cottages. Each of them has a balcony or a verandah. The Resort has its own beach where BBQ is provided once a week. The rest of meals you can enjoy in a restaurant on the territory of the Resort. House reef is located next to the private beach. The Bunaken Village is a boutique hotel built in Indonesian style with some blends of contemporary architecture. You can relax in one of the 8 Cottages or 2 Single Rooms. There is a Dive Center, Spa, a pool, and a restaurant onsite. The Resort pays much attention to the conservation of natural resources. The only wood used at the Village is coconut trees as this is a fast growing plant. Also, there are sun batteries for water heating and power saving lights around the Resort. This resort is integrated with 5-star PADI Dive Center in the eastern part of Bunaken Island. You can choose from Standard and Superior Bungalows built from coconut trees. The owners of the Resort are passionate about diving and ecology; they live at the Resort and take meals together with the guests. There is a restaurant on the territory of Raja Laut. The Dive Center owns 3 boats. This 4-star Eco-resort is located on the western side of Pulau Siladen with breathtaking views of Manado Tua volcano. The Resort launched Turtles sanctuary and installed buoys around the dive sites in order not to destroy the reefs by anchoring boats. Siladen Resort & Spa uses special cleaning products based on bacteria which eat grease converting it into carbon dioxide. The usage of plastic waste is reduced by reusable water containers in the rooms. Rainwater and water from AC are collected to be used in the Resort’s garden. The accommodation is provided in one of 4 types of Villas, including Luxury Villas. The latter ones are equipped with king size beds, 24m² (258 ft²) terraces and sea water Jacuzzis. You can go snorkeling right at the 300-meter (984ft.) long private beach of the Resort. Diving Center is also located on the Resort’s territory to provide the full range of diving services as well as an equipment rental facility. If you prefer to visit more islands in the Northern Sulawesi then joining a liveaboard might be the best idea. There are different itineraries provided depending on the boat operator. Usually, liveaboard operates between April and September. La Galigo was designed with the participation of a diver, so you can expect maximum attention for your comfort at a 33m (108ft.) long two mats Phinisi-style ironwood sailboat. There are 3 main decks and a top sun deck. Up to 14 guests can be accommodated in 7 Cabins and 1 luxury Suite. The latter can host up to 4 persons who can enjoy a private balcony with a table and chairs. Dives are performed from 2 Zodiacs. The Northern Sulawesi itinerary covers Lembeh Strait, Bunaken National Marine Park, and Bangka Island within 10 days. Charters operate between April and September; the starting point is a Bitung harbor. MY Liburan is a 31m (101ft.) long vessel providing comfortable accommodation in 8 cabins. Each of cabins has a private shower and AC. There is also a salon, a sun deck and a dive deck with additional shower and WC. Packages are offered from 7 up to 16 nights stays. Among the serviced itineraries there are Bunaken National Marine Park, Lembeh Strait and Bangka; Sangihe Islands; Togian Islands; and Halmahera Islands. Two Zodiacs are attached to the boat to serve the divers. She is a wooden 25m (82ft.) long liveaboard. MV Paisubatu II is ready to take up to 10 guests aboard who can relax in 2 Twin Cabins, 2 Double Cabins and 1 Cabin for triple occupancy. Each cabin has its own shower and WC. Meals are served at the upper open-air area. There is a tender attached to the liveaboard in order to operate compressors and to store the equipment for the comfort of divers. There are different options of dive packages between 8 and 11 nights. Usually, packages include 3-4 dives per day. The liveaboard serves Bunaken National Marine Park; Lembeh Strait and Bangka Islands; Sangihe Archipelago; Banggai and Togian Islands. MV Renesa is 18m (59ft.) long vessel. There are 4 cabins to accommodate up to 8 persons. Two WCs are to be shared between the guests. There are no fixed dates for itineraries, so the boat can be chartered by a minimum of 2 divers for the desired route and the number of days. If you are interested in a packaged offer, there is an option of 7-night accommodation, 2 night dives, 3 daily dives, and full board. 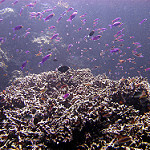 Among itineraries, you can choose Bunaken National Marine Park, Bangka Island, and Lembeh Strait. Another main activity at the Islands is snorkeling. Being one of the best world’s snorkeling destinations Bunaken National Marine Park offers spots right next to most of the land accommodations. Reefs can be easily accessed by snorkelers. However, you should remember about the great depths in some areas and strong currents, so it might be better not to go too far away into the deep. Besides rich coral inhabitants snorkelers have a chance of seeing Turtle and Dugong who often swim close to the surface. If you prefer to go a bit further from the Islands, then you can ask a dive club about a snorkeling trip. During the months of March, July and August there is a high chance of watching Whales migration. Dive centers can organize boat trips so you can enjoy watching groups of Short-beaked and Long-beaked Common Dolphins, Melon-headed Whales, and Pilot Whales. Some lucky ones might see False Killer Whale. You can also take a trekking tour to Manado Tua Volcano. After enjoying your path through the Rainforest you will reach the peak of the volcano located at 850m (2788ft.). Such type of package usually includes transfers to the Island, a guided tour, meals, beverages and fresh coconut milk. If you fancy fishing, you can ask local fisherman about joining them for a fishing trip. It can be arranged only outside of the Marine Park as trap fishing and spearfishing is prohibited in the reserved area. Feeling inspired and raring to go? Check out our Bunaken travel guide and start planning your next diving trip! Habt ihr eine deutschsprechenden Tauchlehre? What are your current prices for Bunaken? We want to book from 24 of July to 27/28 (depends of the budget) of July to stay in your resort and do a couple of dives. Do you have any dive pack for 2/3 nigths? I have a reservation with Booking.com for 13 – 17 August (4nights) in a budget double room. We would like to know whether this has sea views or if we can make a reservation directly with you for another room/bungalow which has sea views? Maybe a double bungalow with sea view? Thank you for explaining the situation. We are looking forward to our stay! do you can pick up me from airport?how much? Hello – I wanted to find out if you have a room available for one person from Dec 26- 29. I will be diving as well for at least one day. What are the rates for diving? Also, I fly out on Dec 29 and will need to arrange transportation (boat and car). How much would this be? Hi would like to enquire a fullboard dive package for 2pax. We will be arriving at 4.30pm on 9th august. Would like to do 3 dives a day. We are also on a student budget. would you be able to propose us a price? Hello, we are a group of 2 family’s, 8 in total. How much does it cost to stay in your homestay for 2 nights, from 19 juli until 21 july. Hello – I am staying Dec 26-29 and will be traveling from Lembeh on December 26. How do I get to Bunaken from Lembeh? Can you assist in arranging a boat? How much will it be? Also, on Dec 29, I need transportation (boat and car) to the airport for an 11am flight. I would like to be there no later than 9:30am. Can you help arrange this and how much is it? Thansk! quels sont les tarifs pour l’été 2019 ? Hello,I’m arriving in Bunaken on the 8th and will stay for few days.Travelling by myself I’m looking for a standard bungalow with toilet on the beach .I will do dives and escursions,Just not sure now about my plans.Can you provide price of accommodation and availability? I’m arriving in Bunaken on the 8th and will stay for few days.Travelling by myself I’m looking for a standard bungalow with toilet on the beach .I will do dives and escursions,Just not sure now about my plans.Can you provide price of accommodation and availability?